Cost: $3,000 Includes meals, a hybrid or EV to drive, all handouts on an 4 gig jump drive, both ACDC EMV books in color, 3 nights at a hotel, over 30 hours of pre-training on the web, pick up and delivery at TF Green Airport in Rhode Island. A hotel at the airport for the last night is about $110. If you fly out after 8pm the last day you will be fine, or spend the night at the airport and fly the next day. This newly created class is based on today’s technology and teaching methods. What they are missing in their training will be answered. All of the ACDC fleet of cars will be here. That is 12 and counting. Most popular HEVs are Gen I, II, III Prius, Toyota Highlander, Camry HEV, Honda Civic I and II, Insight I, Ford Escape, Nissan Leaf and the Chevy Bolt and Volt. ACDC has lots of parts to work with, scan tools, and scopes. Limited to 8 people. Travel day is getting to your Hotel and getting ready for class in the morning. One of the ACDC staff with pick you up at the airport in RI and get you to Worcester. .
Before Class Starts .. You will receive our two color books (if you live in USA) and HEV 101, EV 101 and OEM webinars no matter where you live. That is over 26 hours of on-line training. If you do not finish the pre-study the codes will allow you to study for 3 more months when you return home. At the training center there is a 50/50 split between hands-on and class time. Day 1 8:30 –5:00 pm. Meet at the ACDC training center for hands on work. We will cover; What Makes a Hybrid different from a conventional car? An Overview. Safety, Service, Equipment needed and Maintenance Issues, HV Battery Systems.. NiMH and Li-ion. Electric Power Steering, DC-DC Converter operations. Day 2 8:30 to 5:00 …3 Phase Motors. Motor / Generator Controls, the Inverter. Prius CVT and Volt CVT. Regenerative Braking. High Voltage Air Conditioning systems, Heating, Other cooling systems. 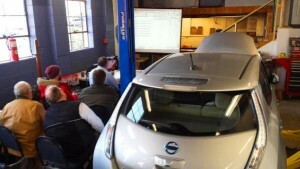 Day 3 8:30 to 4:00 Grid Charging, Electric cars, and more training. Limited to 8 people. We keep it small enough to have time for everyone. We accept AMX, Visa, Mastercard, Discover and a check 30 days ahead of time. Note: Can be taken on the road. You supply the cars and shop. Quote will vary based on your location and what you can provide for cars and equipment.